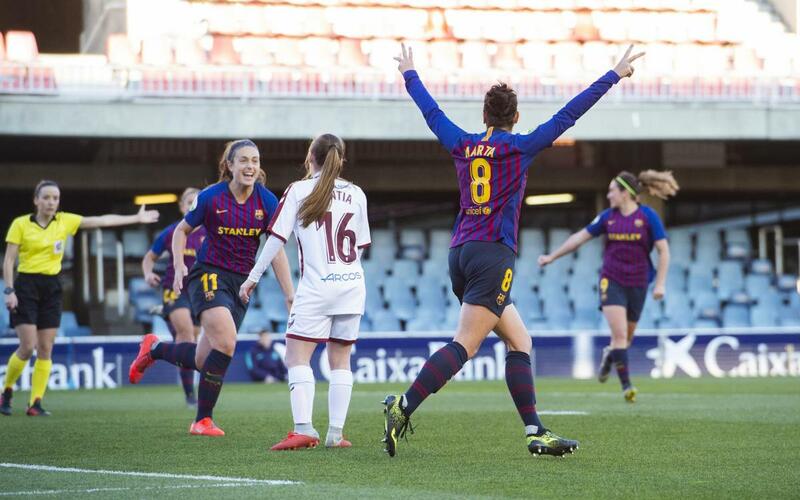 Lluís Cortés’ side were far superior to their opponents, and, thanks to Mariona (min 31) and a double from captain Marta Torrejón (min 59 and 78), Barça Women deservedly took the points. After an early scare, Barça took control of the game. Attacks were constant, with Andressa Alves and Lieke Martens in particular proving a handful. Mariona opened the scoring from an Alexia assist (1-0, min 31), and though the hosts continued to enjoy chances, they came and went without success. The second half began in a similar way to the first, and in the 55th minute Barça thought they had extended the lead through Andressa Alves but it was ruled out. Completely against the run of play, Alba Redondo then drew the visitors level (1-1, min 57). The joy was short-lived for the visitors, who saw Barça turn the situation around just two minutes later. Martens delivered an exquisite cross for Marta Torrejón to finish off (2-1, min 59). Fifteen minutes from the end, the Blaugranes once again pressed the accelerator, with the third and definitive goal, again from Marta Torrejón, coming from Candela's assist (3-1, min 78). A important win to continue fighting for the title. Fundación Albacete: Vamberger, Padilla, M.Pérez, Tomo, Mati, Redondo, M.Costa (Hitomi, min 85), Cintia (Bulatovic, min 67), Sandra, Rebeca (Navarro, min 67), Sofi (Pomares, min 67).